Governments must be able to change their tax systems to ensure multinationals pay their fair share and to ensure that critical public services are well funded. States must also be able to reconsider and withdraw tax breaks previously granted to multinationals if they no longer fit with national priorities. But their ability to do so, to change tax laws and pursue progressive tax policies, is limited, thanks to trade and investments agreements. In rapidly developing ‘corporate courts’, formally known as investor-state dispute settlement system (or ISDS), foreign investors can sue states directly at international tribunals. This system has become increasingly controversial thanks to negotiations over the proposed Transatlantic Trade and Investment Partnership (TTIP) deal between Europe and the United States. But access to ISDS is already enshrined in thousands of free trade and investment agreements crisscrossing the globe. Because control over taxes is seen as core to a country’s sovereignty, many states have included tax-related ‘carve-out’ clauses in these trade and investment treaties to limit ability of corporations and other investors to sue over such disputes. But a growing number of investor-state cases have in fact challenged government tax decisions – from the withdrawal of previously granted tax breaks to multinationals to the imposition of higher taxes on profits from oil and mining. 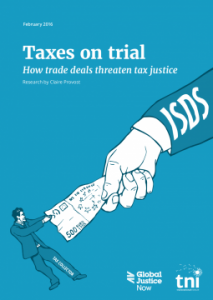 Analysis of data and documents on hundreds of ISDS cases filed so far reveals that foreign investors have already sued at least 24 countries from India to Romania over tax-related disputes – including several cases where companies have used this system to successfully challenge – and lower – their tax bills.